Ghost stories. They're the stuff that legends can be made of. In the right setting, they can scare the living daylights out of even the toughest of people. Macho guys? Yeah, they can turn into sobbing, quivering, whimpering little girls if you can find a way to freak them out well enough. So, what happens when you, say, end up being trapped inside an old school house that the world knows to be haunted? Run and scream is what! That's what we have in the action comedy from the minds of Kodansha and Studio Pierrot, Ghost Stories. 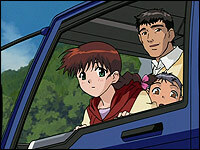 Shortly after the death of her mother, Satsuki, along with her father and her younger brother, Keiichirou, moves from Tokyo to the small town where her mother had grown up. Stories have been told to the kids about how their grandmother had been the Principal of the local elementary school that they both would be attending. As they approach their new home, they see the old school house that had been replaced by the newly constructed one next door. Rumors are that the old school buildings have been infested by all manner of evil spirits and demons. 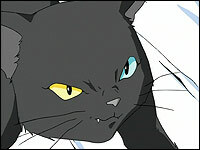 Upon arriving at school their first day, Satsuki finds that Keiichirou brought their cat, Kaaya, with him to school. Kaaya runs off and ends up inside the old school, prompting Satsuki and Keiichirou to follow. Once inside, they are joined by three other students: Hajime, the school jock, Leo, the resident nerd and paranormal expert and Momoko, a soft-spoken yet fanatical born again Christian. As several ghosts begin come out, they find themselves trapped inside the old building. The uber-demon Amanojaku appears and makes quite the mess of the place as he tries to run the kids down. Freaked out of their wits, and after a good amount of screaming and running around like a chicken with its head cut off, they are chased into a room where they find Kaaya with a picture of Satsuki's grandmother. 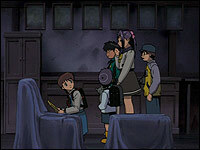 Hidden inside the frame they find something unexpected, a notebook that belonged to Satsuki's mother. Inside there are notes and drawings about the various ghosts inhabiting the schoolhouse, as well as info on how to lock them away from the real world. 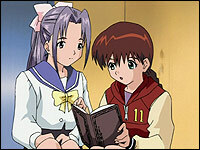 Eventually Satsuki is able to use the info in the book to make the demon disappear. They find that the book tells them where the demon is supposed to go when he enters sleep mode, a tree up on the hill behind the school. Having gotten rid of Amanojaku, they're finally able to leave the old school building. Once outside, they come to find that the construction going on has destroyed the tree and the spirit of Amanojaku has taken over the body of their cat, Kaaya. 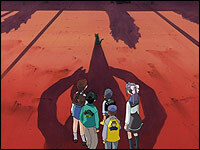 Now it's up to Satsuki and her friends to seal away the ghosts before they can wreak more havoc on the poor school. Totally miffed that he's stuck in the body of the cat, Amanojaku will do whatever it takes to trip them up. Can Satsuki and the others stop the myriad of evil spirits from terrorizing the student body of the school and prevent the ghosts from messing up everything the can get their paranormal little hands on? The answers are in the book. And in the upcoming episodes. In the few places that the series has been leaked, there's been a growing commotion over the English version. What's all the commotion about? Well, it's all about the dub. No, it's not the usual dubs vs. subs argument. It's something much more sinister, but that's sinister in a good way. What ADV ended up licensing was a kids show that was, to be honest, nothing to write home about from a story standpoint. The whole "kids battling the evil ghosts" concept is about as old as, well, some of the ghosts in the show. Under normal circumstances, a show like this would have been destined for the Under $9.99 shelves at your local video retailer. But ADV producer Steven Foster threw the anime community for a loop with the production for the English version of Ghost Stories. Typically the importing company would get the script translated and then the show would be dubbed based on the script. Most companies would say that something like this would be enough, but our friends at ADV decided to take the show and turn it into a hilarious ad-lib romp through the world that these poor kids have to now live in. The story line was left intact for the most part, but the script was tossed out the window as the voice actors have the chance to play off each other's random comments throughout the series. What we're treated to is a witty comedy fest for an audience that is much older than the show was originally intended. Ghost Stories is irreverent comedic insanity at it's best. It's the show to watch if you want to sink your teeth into something that is a true gem of anime comedy. This is one time that a dub is highly recommended to the subtitle crowd. The voice acting from ADV vets Hillary Haag, Chris Patton, Greg Ayers, Christine Auten, and Monica Rial make the dub a blast and a half to watch. The way they're able to play off of each other as they deliver their performances is nothing short of spectacular. The amount of pop culture references and puns will leave you rolling on the floor. (Heck, if you listen really carefuly in Episode 4, you can even hear Hillary make fun of Chris who in turn makes fun of Greg.) 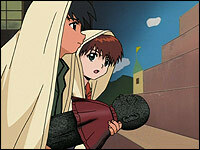 Of course, if you really can't handle the dub, the original Japanese was left intact. The subtitles also follow the original Japanese translation. Ghost Stories give a little bit of something for everyone. If you want a good laugh, just leave the dub track on. Either way, Ghost Stories will scare you silly.